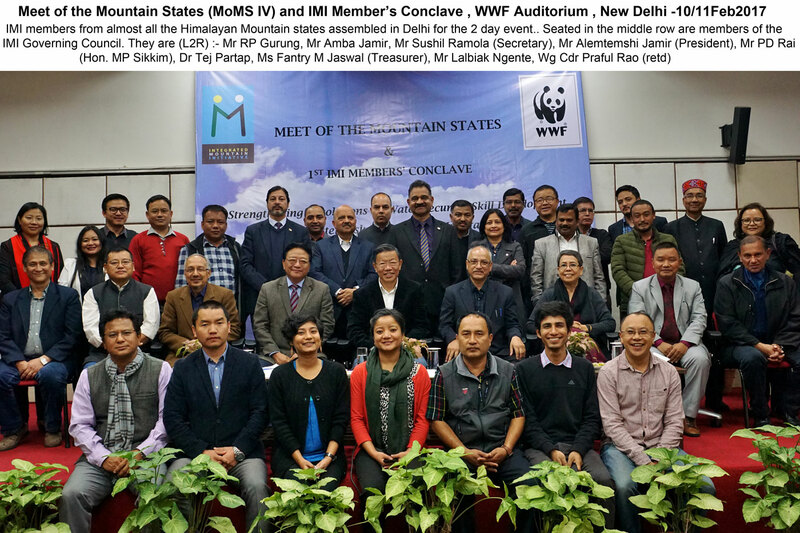 10 February 2017, New Delhi : The fifth edition of the Meet of the Mountain States organized by the Integrated Mountain Initiative was held today at WWF India Secretariat in New Delhi. The Meet deliberated on subjects of water security, skill development and disaster risk reduction in the mountains. The Meet was inaugurated by Hon’ble Minister of State for Home Affairs, Shri Kiren Rijiju. Members of Parliament, Dr. Thokchom Meinya (Manipur), Shri Vincent Pala (Meghalaya), Shri Jitendra Chaudhury (Tripura), Shri. P.D. Rai (Sikkim) and former Member of Parliament Shri Tarun Vijay were also in attendance. 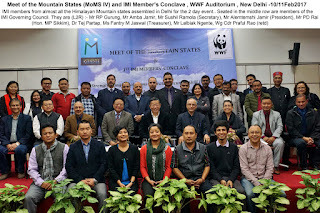 The Integrated Mountain Initiative (IMI) is a civil society organisation formed in 2011, aimed at redefining the architecture of sustainable development across the 12 mountain states in the Indian Himalayan Region, comprising 10 states of Arunachal Pradesh, Uttarakhand, Meghalaya, Manipur, Mizoram, Nagaland, Tripura, Sikkim, Himachal Pradesh, Jammu & Kashmir and the hill districts of West Bengal and Assam. It is a collective initiative for recognizing the value of mountain regions and enabling people to realise its potential by integrating the knowledge and experiences of multiple stakeholders. IMI operationalizes this platform through its annual Sustainable Development Summits (SMDS) and Meet of Mountain States (MoMS) by engaging different stakeholders to come together and engage in informed debates on themes relevant to the mountain regions. Shri Rijiju released the proceedings of Sustainable Mountain Development Summit V held in September 2016 in Leh. Shri Rijiju stressed on the need to work in convergence to ensure sustainable development in the mountain regions of India. He also highlighted the dilemmas of livelihoods in the development context and environmental consequences of development facing the mountain cities which has led to severe damage in valleys of Kullu and Manali and hill cities of Mussoorie, Nainital amongst others. As a part of the Meet, a legislators’ dialogue was also held. All Members of Parliament insisted on the need to focus on research in mountain subjects such as glaciology, hydrology, renewable energy, human-wildlife conflict and biodiversity. Shri P.D. Rai also shared the path followed by Sikkim towards sustainable development. He also mentioned that the state is moving to build a legislation to mainstream the subject in all departments and amongst the citizens. The Meet was convened by Shri Alemtemshi Jamir, President of IMI and former Chief Secretary of Nagaland. 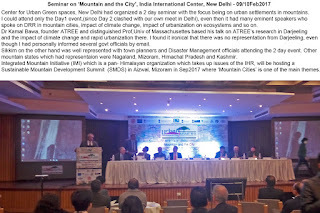 Several eminent leaders of the development sector from organisations such as FAO (UN), NECTAR, UNDP, NSDC, ICIMOD, SDC, WWF and senior officials from ministries and government departments were in attendance. There was rich sharing of ideas by the officials and the development agencies with respect to building collaborative action plan for mountain. They emphasized the need for stronger mountain partnerships and integration of sustainable development goals into mountain development. Skill development emerged as one of the areas where a lot can be done. Dr Divya Nambiar from Ministry of Skill Development and Entrepreneurship spoke about theneed to prepare a ‘Sustainable Skill Development Plan for Mountain States’. It was pointed out that skill building needs to factor in the socio-cultural and geographical features of mountains and focus on self-employment and entrepreneurship. Therefore a Sustainable Skill Development Plan for Mountain States will come up with innovative new ideas to scale up skill training initiatives in the region in a manner that is responsive to local requirements and at the same time sustainable, over time. Importantly, it must also align with theaspirations of young citizens in the region. Mr Shyam Khadka, Country Representative, FAO pointed out that Information on the mountain systems is very limited and hence establishingMountain Partnership could help generate this knowledge base which is limited tothe mountain communities at the moment. He also highlighted the need to fill knowledge gaps and community based solutions to problems in the mountain states, and that IMI must work on this aspect. 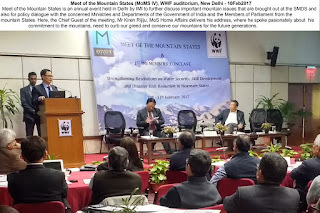 Mr Ravi Singh, CEO, WWF India also emphasized that to find solutions to the problems, communities must be integrated within the systems aimed at finding solutions and that their voices must be integrated into policymaking processes. Mr Brij Mohan Rathore, Country Focal Person, ICIMOD spoke about creation of value chains for sustainable employment opportunities and entrepreneurship through network of entrepreneursin mountain states and trans boundary landscape programmes. The need to focus on sustainable mountain cities and climate change was also a recurrent theme. 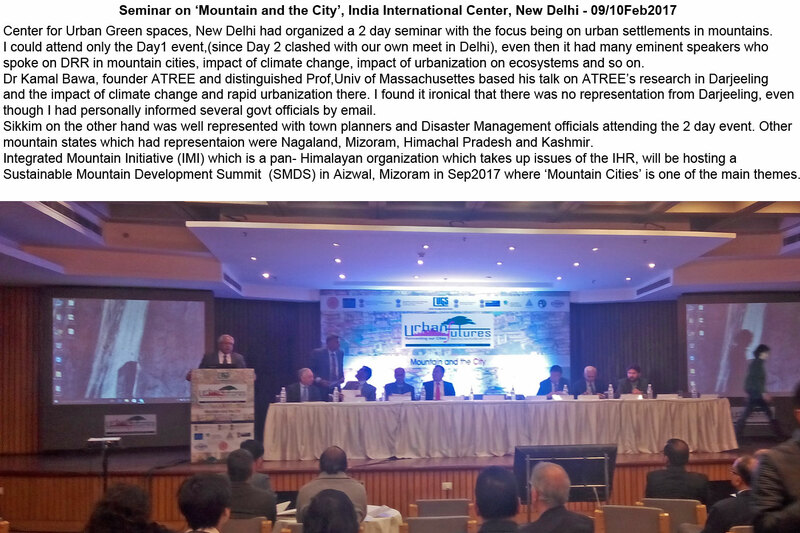 IMI announced that the next Sustainable Mountain Development Summit which will be held in Sep, 2017 in Aizawl, Mizoram will take up these issues for further deliberation. First IMI Members’ Conclave was held on 11 February following the Meet of the Mountain States. Members’ Conclave was a powerful congregation of individuals and institutions who are members of the State Forums or Chapters. It included deliberations of issues raised by members from different states, presentations by the state chapters where they highlighted the status of and the activities being carried out by the chapters. IMI’s ongoing projects were discussed with all the members and strategy for the coming years was also discussed. Sustainable Mountain Development Summit VI to be held in Aizawl, Mizoram was discussed with all the members. Dr. Lalbiak Ngente presented the concept of SMDS VI on behalf of Mizoram Sustainable Development Forum. All members made suggestions and committed to the organisation of the Summit.